Stitch Guide: Broomstick stitch – The broomstick stitch requires two steps to complete one row, a loop step and a crochet step. Insert your hook into the first chain or stitch and draw up a long loop. Place this loop on the knitting needle with the working yarn at the front of the work. Continue drawing loops through the chains or stitches and placing them on your hook until you have reached the end of your row. Move the working yarn to the back of the work. Count the first 5 loops and insert your hook from left to right underneath all 5. Carefully slide these 5 loops off your hook. Pick up your working yarn and yarn over (yo) and pull through the loop on your hook. Chain one to lock it in place. Sc 5 times around the loops. This will create the twist in the stitch. Pick up the next five loops just as before and sc 5 times across the top. Continue to the end of the row. This tutorial is also available in a left handed version. Click here to be directed to the left handed tutorial on YouTube. Pull up the last loop on your hook and place it on the knitting needle. Be sure to orient your working yarn so that it is in the front of the needle. Pull up your slack so you have a snug tension. Insert your hook into the next chain, YO, pull up a loop and place that loop on your knitting needle. Repeat for all 30 chains. Be sure to count the loops on your knitting needle at the end. You should have 30. Secure the first 5 loops from the needle onto the index finger of your dominant hand. Carefully remove the other loops from the knitting needle. With your working yarn coming from behind, insert your hook into the group of 5 loops from the left side. YO and pull up a loop, YO and pull through the loop on your hook. This will lock the stitch in place. Ch 1. Sc 5 more times into the gap. *Grab 5 more loops, making sure to keep them in order and insert your hook in the same fashion as before. YO, pull up a loop, YO and pull through the first loop on your hook. YO and pull through both loops (Counts as sc). Sc 4 more times into gap. Repeat from * across. Pull up the loop from your last sc and place it on the knitting needle. Be sure to orient your working yarn so that it is in the front of the needle. Pull up your slack so you have a snug tension. Insert your hook into the back loop of the next stitch YO, pull up a loop and place that loop on your knitting needle. Repeat for all 30 chains. Be sure to count the loops on your knitting needle at the end. You should have 30. Secure the first 5 loops from the needle onto the index finger of your dominant hand. Carefully remove the other loops from the knitting needle. With your working yarn coming from behind, insert your hook into the group of 5 loops from the left side. YO and pull up a loop, YO and pull through the loop on your hook. This will lock the stitch in place. Ch 1. Sc 5 more times into the gap. *Grab 5 more loops, making sure to keep them in order and insert your hook in the same fashion as before. YO, pull up a loop, YO and pull through the first loop on your hook. YO and pull through both loops (Counts as sc). Sc 4 more times into the gap space. Repeat from * across. Repeat row 2 for a total of 35 rows. To finish your infinity scarf, take a spare piece of yarn and fold the scarf in half, wrong sides facing each other, and whip stitch across the edge into each stitch. Weave in your ends. You may also enjoy the matching hat! I would like to know how many skeins to buy for a straight scarf? What other kind of yarn works for the brroomstick pattern? Which needle works better the plastic or wood? Thank you. I love this!! I didn’t have the knitting needle and was too anxious to wait and buy one, so I’m using my sons light saber ?? it’s working out great thanks to your detailed tutorial!! My only problem is.. why is my yarn so frizzy and yours is so perfect and tame? I’m using the same yarn ? RH Boutique Unforgettable is known for it’s frizziness. I find that being extra careful with it (not ripping out stitches or stashing it in a bag) helps quite a bit. It happens as a result of repeated rubbing so I do what I can to limit this. Mine started out nice and tame but after a few wears, has some frizz to it. On the broomstick lace design, can you just finish after 35 rows instead of making it an infinity scarf, just keep it long? Also, can you use a thicker yarn? This is a pretty versatile stitch pattern. 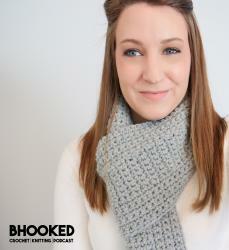 You can convert it to a straight scarf and you can also use any weight yarn. The openings may be a little smaller as a result of using thicker yarn but the outcome is still beautiful. Thanks for the tutorial on this lovely scarf AND what beeeeautiful hands you have! I just moved from Hawaii to Idaho and it is COLD here–I see many scarves in my future and this will definitely be one of them! I saw this yarn the other day and thought it was beautiful but had nothing to make with it at the time. I’ll definitely be getting some now. Thanks for the pattern. Thanks so much for posting this pattern, it’s awesome! It did take some patience to get the hang of it, but thanks so much for the videos — they really helped! Was looking for a project to get back into crochet and this was perfect. And my local crafts store was having a 50% off sale on the fabulous Unforgettable yarn — working with Dragonfly now, got Stained Glass and Tidal, and will probably make a trip back for more this week, these scarves will make great gifts..
where to buy this wool in France ? Hi. I am currently making this scarf. Approximately how long should I expect it to be before I whip stitch it together? Thanks. beautiful scarf and I’m excited to make it! The directions are not the same as the tutorial instructions. For instance the written directions say to hold the first 5 loops and take the remaining loops off the knitting needle. The tutorial (which is correct) leaves them on taking off 5 at a time while making the beautiful stitch. Hi Amber! I’m glad you are excited about making the broomstick lace infinity scarf. To clear up your concerns about the tutorial and pattern not matching, there are actually different ways to work the broomstick stitches. I demonstrate the way I like to work them in the tutorial and present the alternative method with the written instructions. i must retract my comment the video does show pulling the loops off. I would definitely recommend watching the video tutorial before you make the scarf. She gives very detailed directions during the video. This is a beautiful pattern, thank you so much for sharing it with us and taking the time to make the video! I am making a scarf right now after watching your tutorial. I love this stitch! Am I missing something or is there a mistake in the written instructions? In the instructions for the 2nd Pass, shouldn’t it say to make 4 more sc in the gap (hole) before it says, “Repeat from * across.”? Thanks! Melanie, you are correct…thanks! Problem fixed. Oh yes it does…fixed. That’s very creative! Do you know how I can get this pattern in knitted format for two broomstick knitting needles? Love the look of the finished product. I have never seen this pattern translated for knitting. I imagine it could be done with two different size needles and a little creativity! How many skeins of yarn does it take to make this beautiful scarf? I used less than one skein of yarn for this scarf. If I had to guestimate, I’d say I used about 2/3 of it. I only got 26 rows out of one 3.5 oz skein. The pattern calls for 35 rows.